After 37 hours of work, spread over 12 days, I’ve completed cedar maintenance activities on the first and largest field on my winter maintenance list. 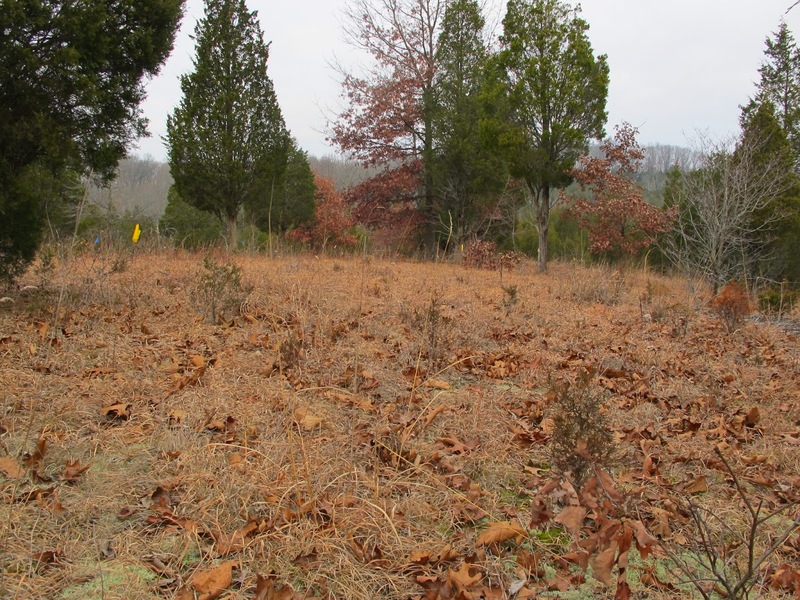 A narrow ridgetop dead ends in the center of this eight acre field. In this area is found the largest Blue Jay Barrens population of the rare Edwards’ Hairstreak butterfly. The land falls away in all compass directions from the serpentine ridgetop. 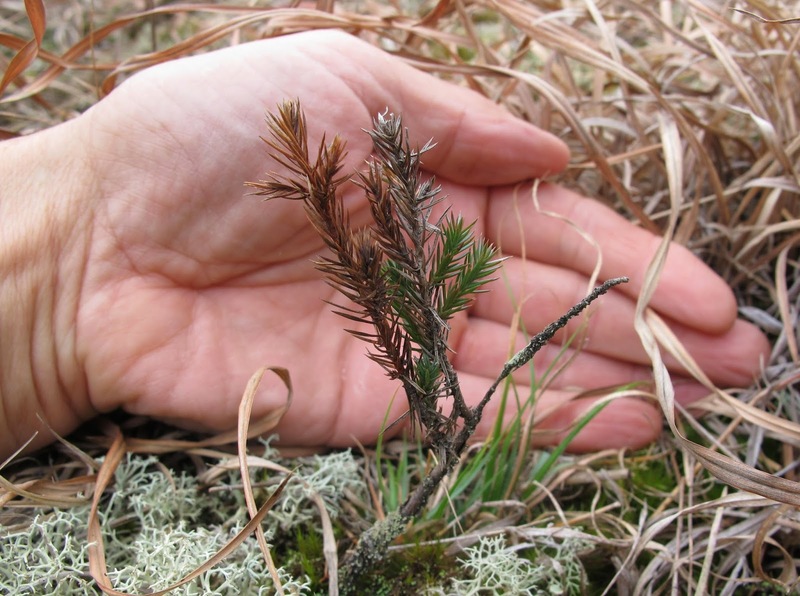 The population of small cedars has now been nearly eliminated. When I last conducted cedar maintenance on this field ten years ago, I spent only three hours on the activity. 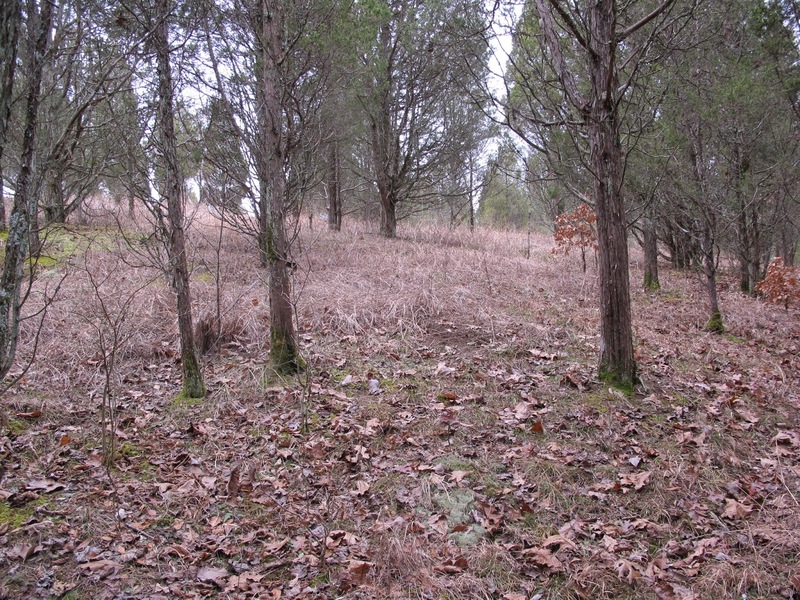 I performed a much wider search pattern and removed only those cedars that were easily seen. That explains why so many of the larger young cedars that I just cut were clearly older than ten years. I’m hoping that my more intensive search will allow the field to go several years before young cedars once again become noticeable. 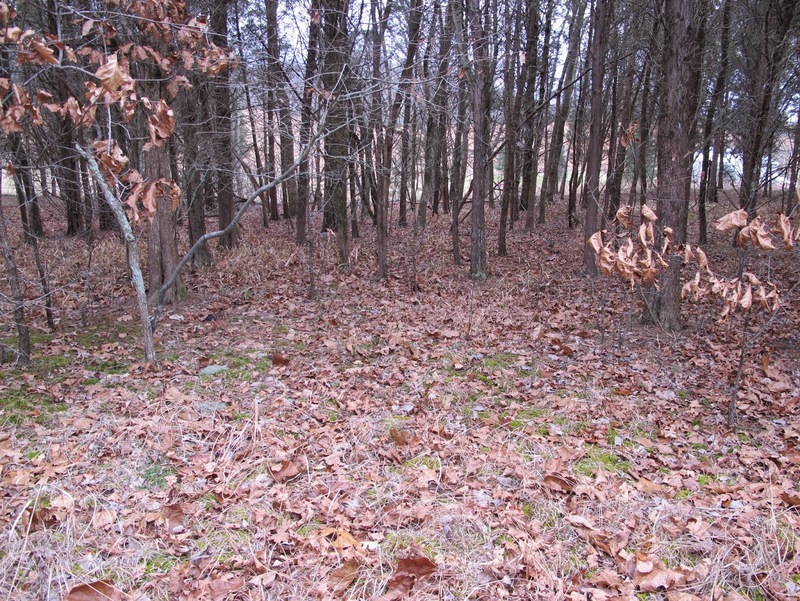 The edges of the field are bounded by woodland or cedar thickets. This line generally marks the transition to deeper soil. Grass growth ends abruptly where the tree canopy closes to block the sunlight. 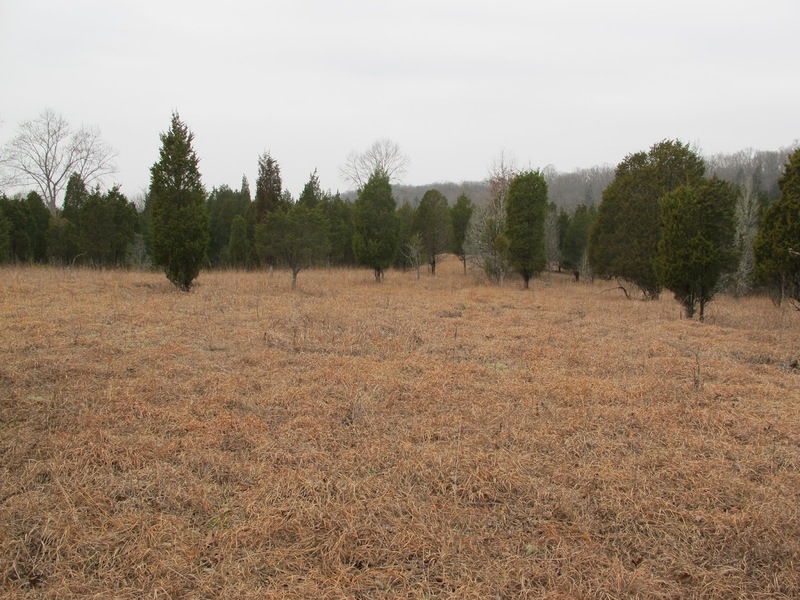 Larger Eastern Red Cedars are scattered throughout the field. In most cases, sun loving grasses and wildflowers grow right up to the trunks of the trees. Some wide spreading cedars develop a community of woody plants beneath the tree canopy. I sometimes call these grassy fields prairies and other times refer to them as barrens. I’ve studied many different systems of classifying grassland communities and have trouble finding a suitable identifier for Blue Jay Barrens. 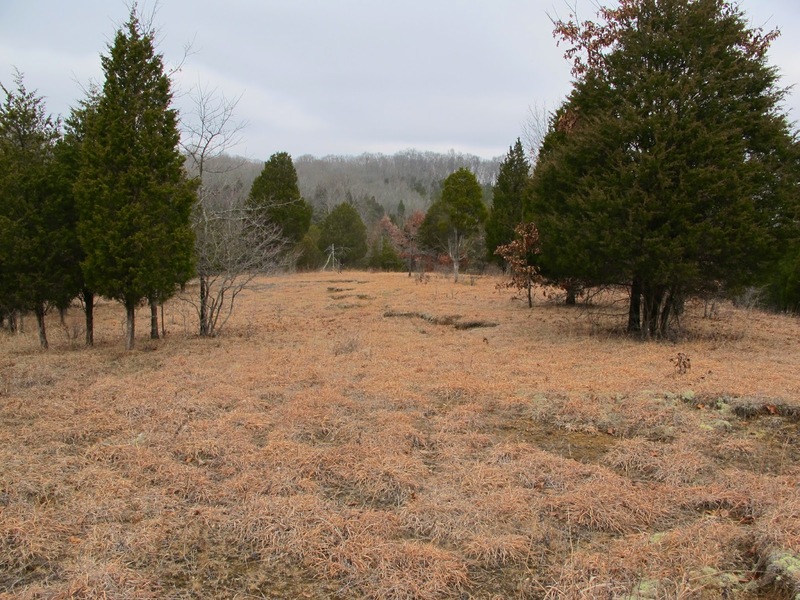 Some portions of the field are treeless, but these aren’t the broad expanses of grass associated with prairies. Several portions of this field would fit neatly enough into categories of common classification systems. Because of a wide range of vegetation, soil depth and bedrock type; it’s the field as a whole that doesn’t seem to belong. 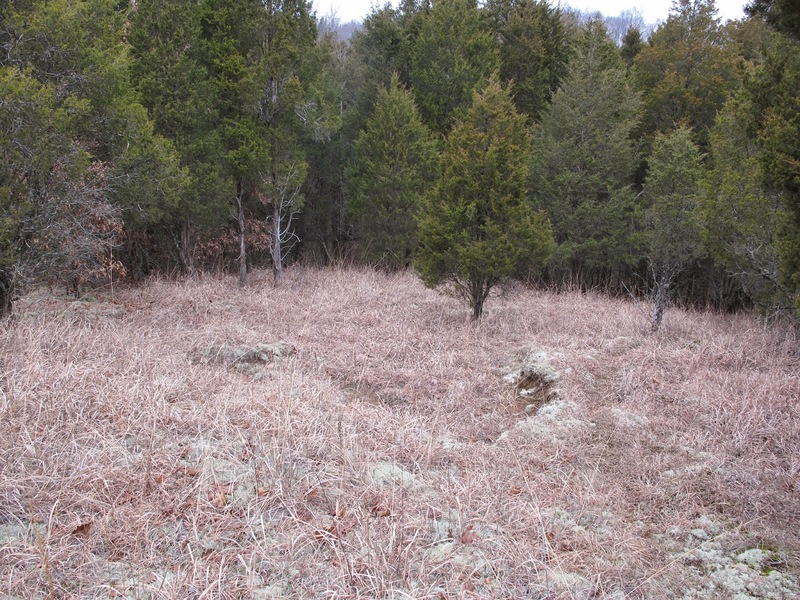 The term barrens seemed appropriate when I named the property years ago and I think it is still my preference. Whatever it is, I’ve relieved it of several thousand tiny cedars and the rare plants found here will benefit by that action. 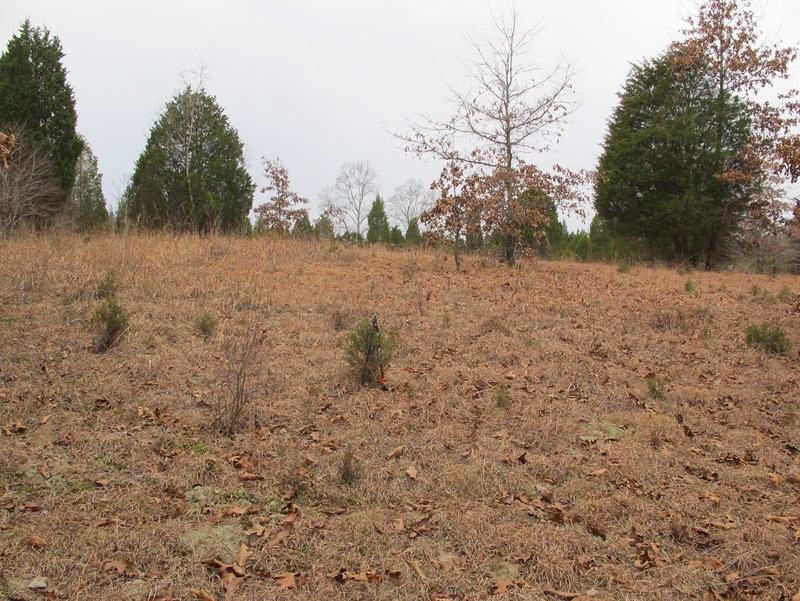 When I did my original clearing of this field 25 years ago, I left a small area untouched as an example of what the field was like prior to my management. 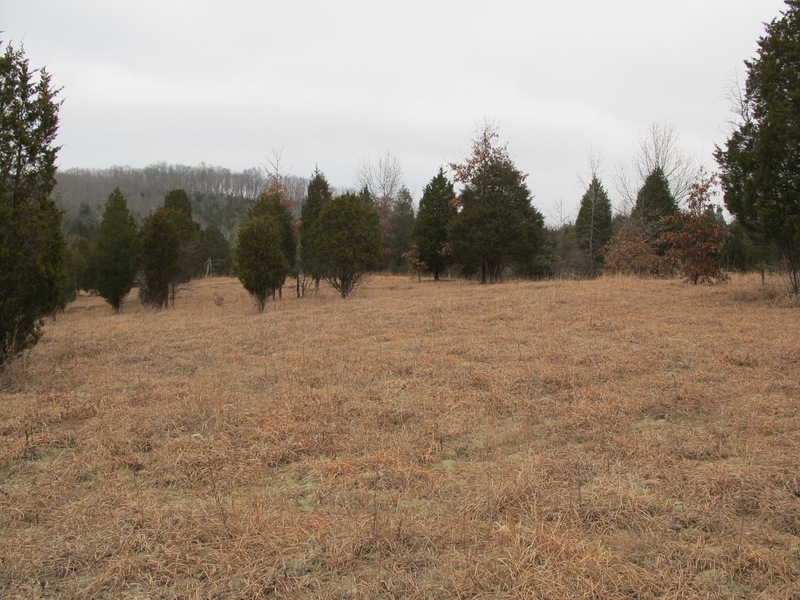 The fact that the cedars have made little noticeable growth since then is testimony to the poor soil and harsh growing conditions on this site. Some of the trees originally cleared from the field were no taller than this, but showed 60+ growth rings in a trunk not much over one inch in diameter. 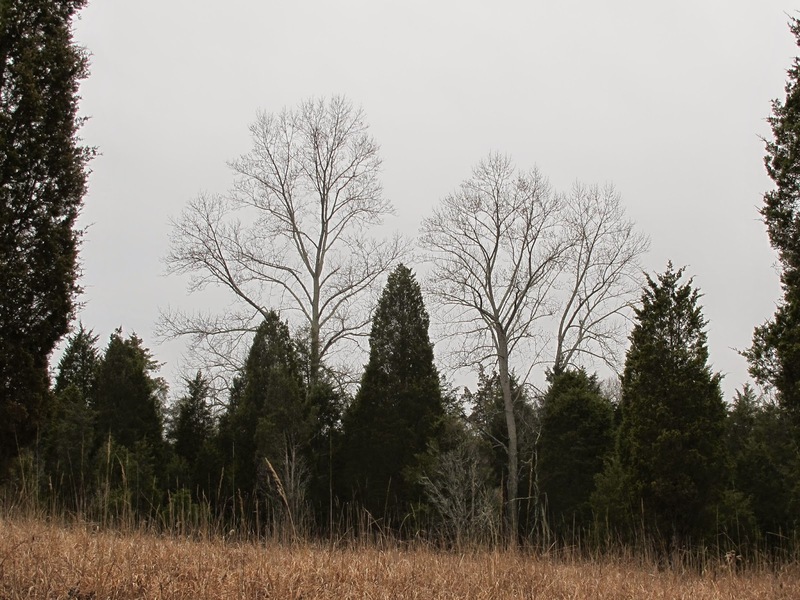 The cedars originally cut from the field formed six massive brush piles. The pile at the base of this cedar once rose up into the green branches of the tree. Many of the large cedars have been around for more than a century. 1938 aerial photography clearly shows these trees having been large even back then. I believe them to be a valuable component of this uncommon ecosystem. 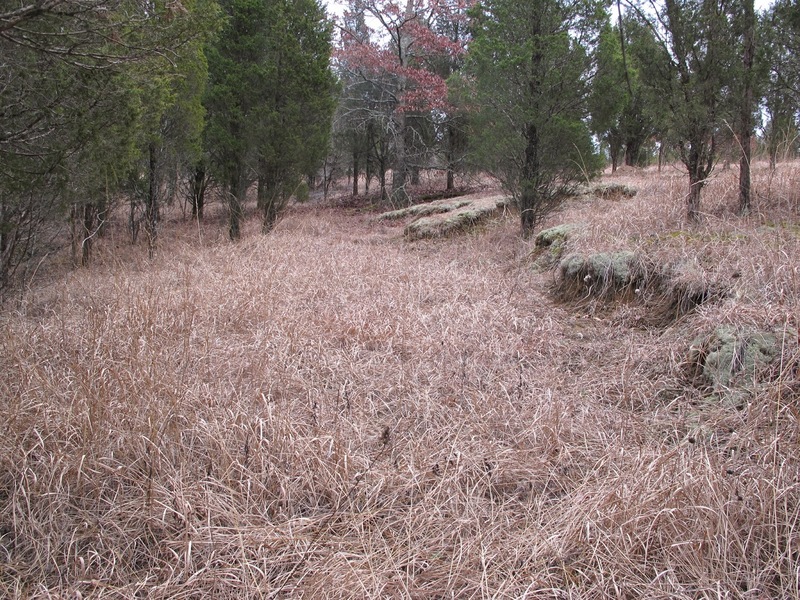 Cut banks are clear evidence of massive erosion that historically occurred on the site. 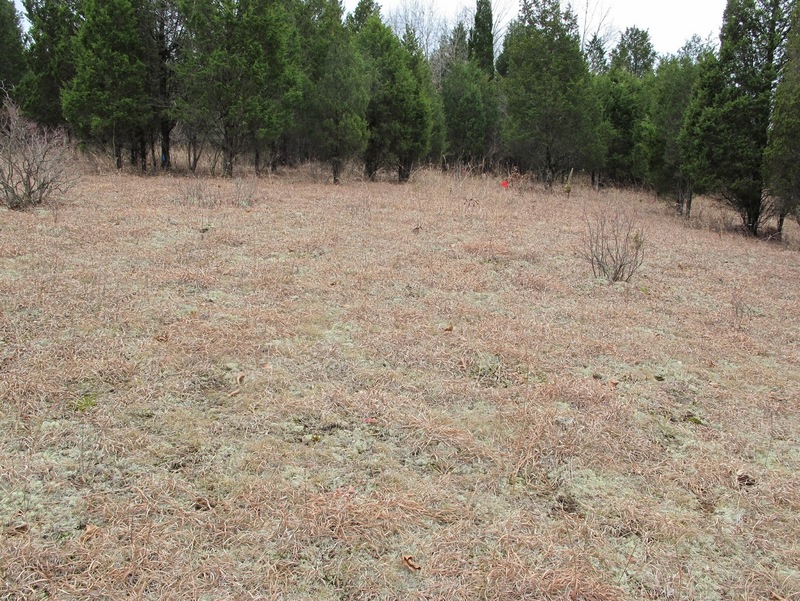 Areas of bare ground that were present when I first took possession of the property are now covered by native vegetation. Instead of continuing their progression back into the field, the cut banks are mellowing down to a gentle slope suitable for plant growth. As I worked, I used orange ribbon to mark items that I wanted to come back and deal with later. Here is a tangle of barbed wire, thrown into a gully decades ago and left to rust. At some time in the future I’ll probably have to decide how many and what species of oak will be allowed to grow in the field. 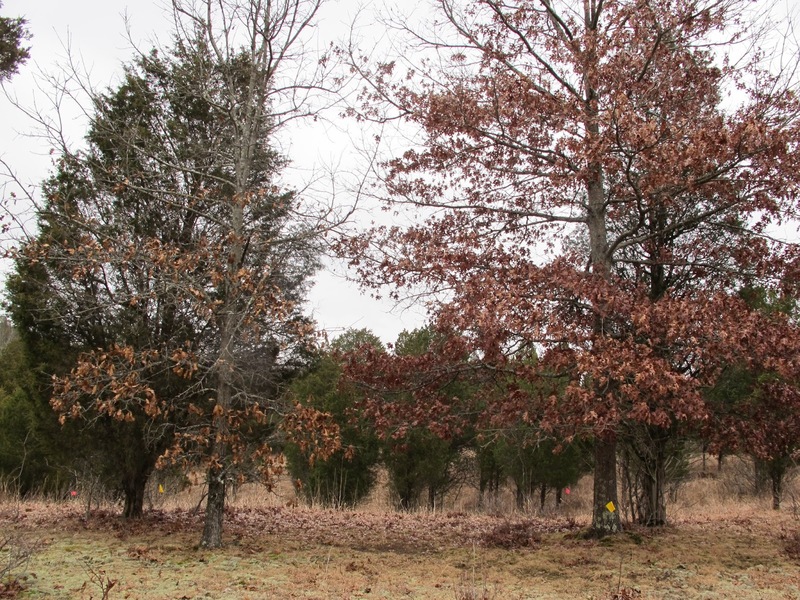 I found it interesting that the Red Oak on the right was ringed by a thick stand of cedar seedlings, while the Blackjack Oak on the left had almost no cedar seedlings. 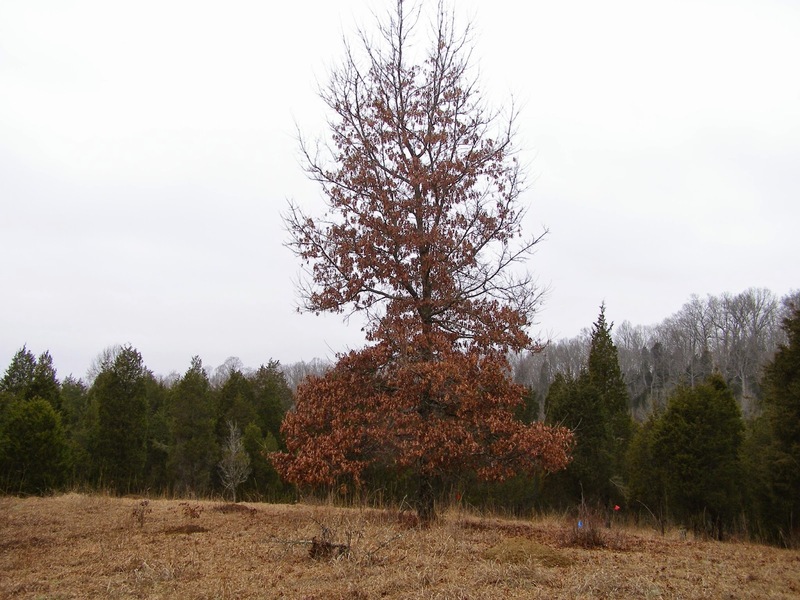 Blackjack Oak is favored by the Edwards’ Hairstreak Butterfly, so I would hope to maintain that species. 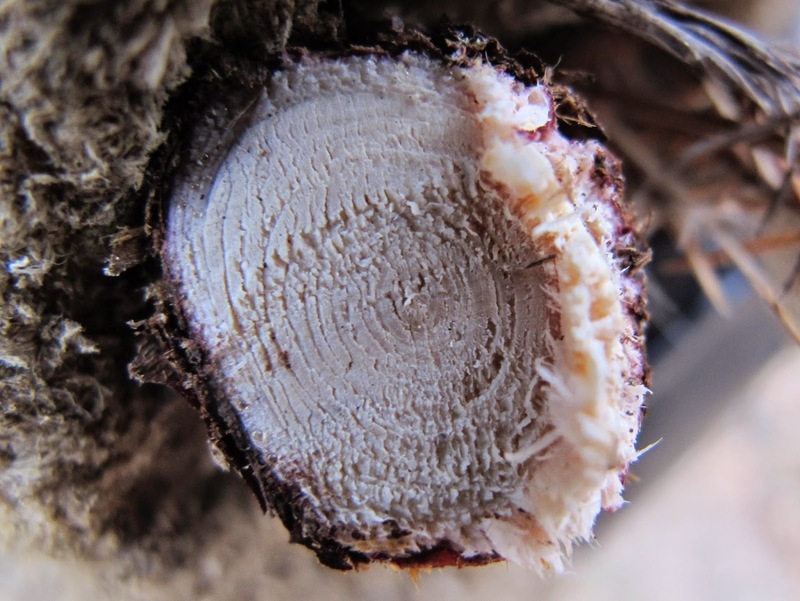 If a point is reached where some oaks must be eliminated, the Red Oak is certainly looking like a species that could be sacrificed. It’ll be a while before a decision of that nature will be required. I’ll probably still be thinking about it the next time I do cedar maintenance in this field. The weather hasn’t been cooperating fully, but I’ve still managed to spend a little time each day working on the Cedar Maintenance. This completed section is part of an eight acre field that I hope to finish up before the end of the month. I try to take plenty of before and after photos to document my efforts. 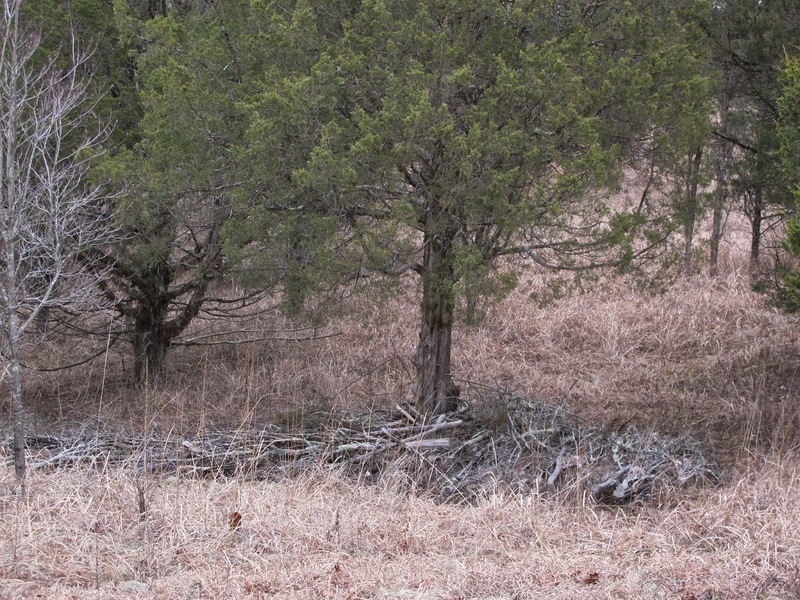 Unfortunately, most of the small cedars don’t show up in a landscape photo. 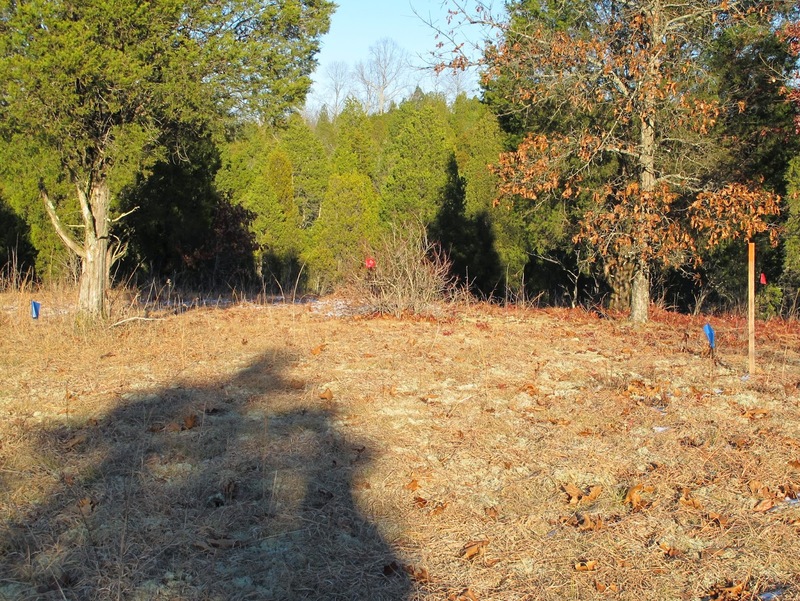 The change displayed in this after photo is more a result of the appearance of a sunny afternoon than the loss of a few visible cedars. 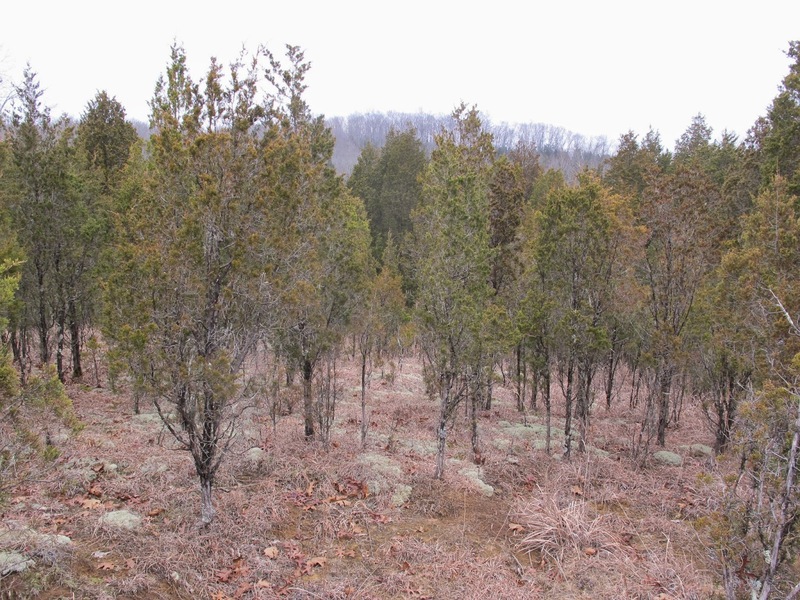 The density of cedar growth varies considerably across the field. I’ve estimated that, depending on conditions, it takes somewhere between 2 and 25 hours to clear the little cedars from an acre of ground. It is somewhat discouraging to suddenly find yourself in a close growing forest of young cedars. 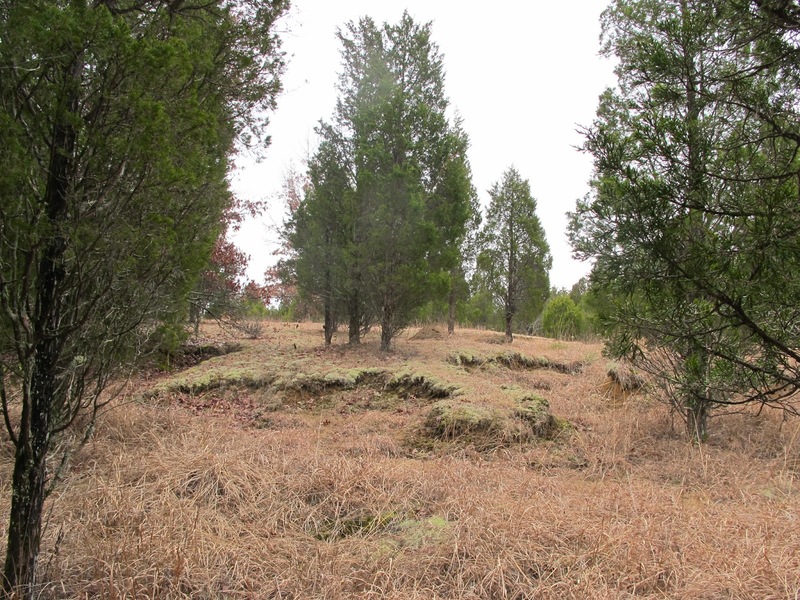 In some of the poorer soil areas, the cedars barely reach out of the short growing grass. This beauty, just barely topping out at eight inches high, is the result of at least ten years of growth and is a giant in comparison to the other cedars nearby. Within the body of the plant are die backs, resprouts and segments of short annual growth testifying to its struggle to survive. My bushel sized tub can hold several hundred of these tiny plants. This collection was made from an area just over a quarter acre in size and there is still room for more in the tub. 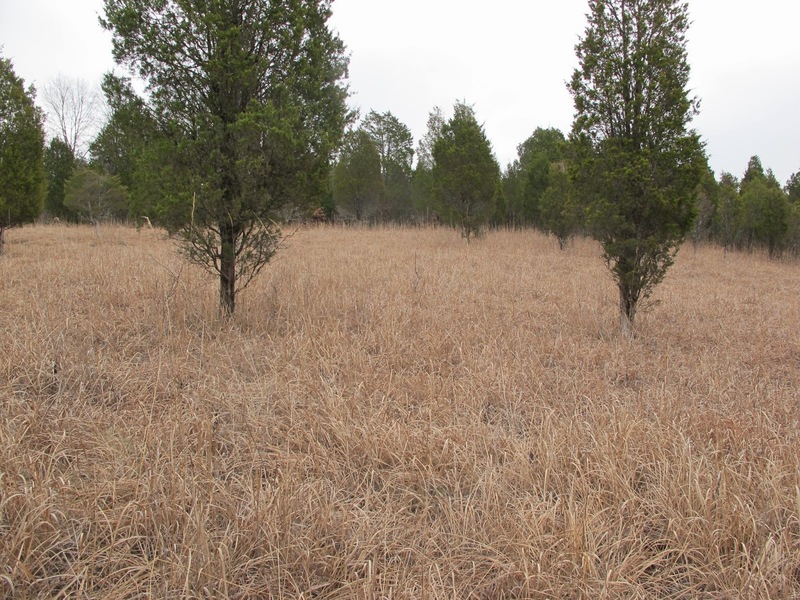 The prevalence of small cedars is influenced strongly by the other plants growing in the field. This large Red Oak can be thought of as a cedar magnet. The oak doesn’t actually attract cedars. It’s birds that find a solitary tree to be an excellent roost. Fruit eating birds, with bellies full of cedar berries, will flock to the tree to spend the night. Before departing for the next days foraging, the birds will expel with their droppings the indigestible cedar seeds. With their coats softened by the bird’s digestive juices, the seeds are in a perfect condition for germination. Several seeds can be found in each dropping, so it’s common to find these little groupings of three or four seedlings growing tightly together. The result is an ever growing population of cedars developing in the shadow of the oak. The seeds for this group probably all fell together and benefited by the small nutrient boost provided to the soil by the bird dropping. Fortunately, the majority of these seedlings will die before they are more than a couple of years old. 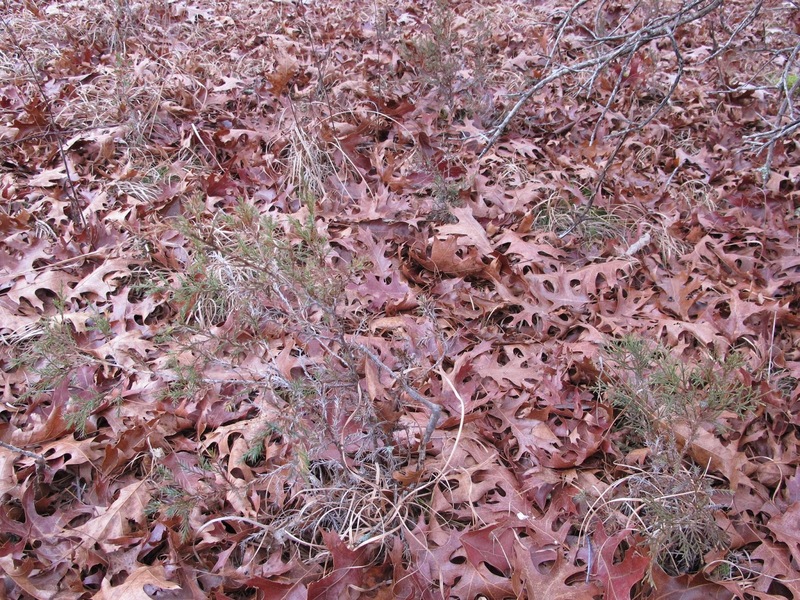 Enough of the seedlings do survive to create a cedar thicket beneath the oak tree. 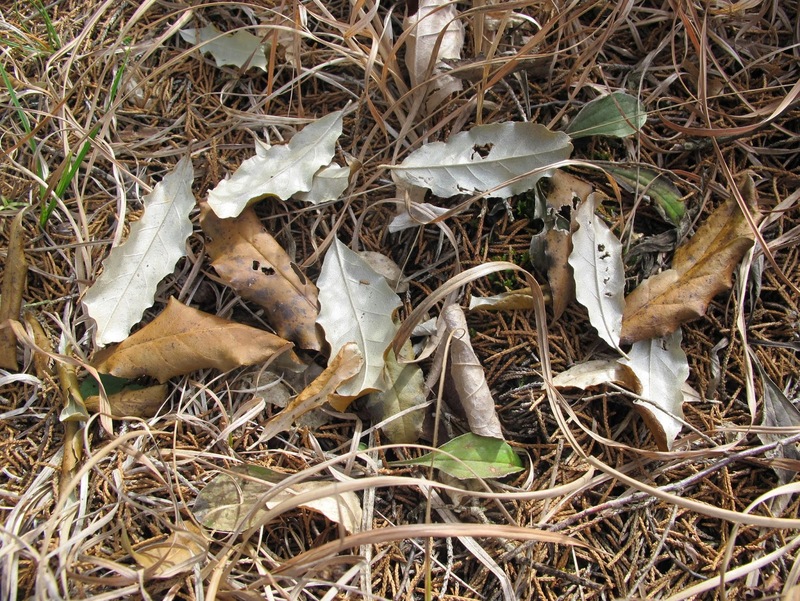 Besides attracting flocks of seed dropping birds, the oak leaves provide a complication for those trying to clear out the small cedars. 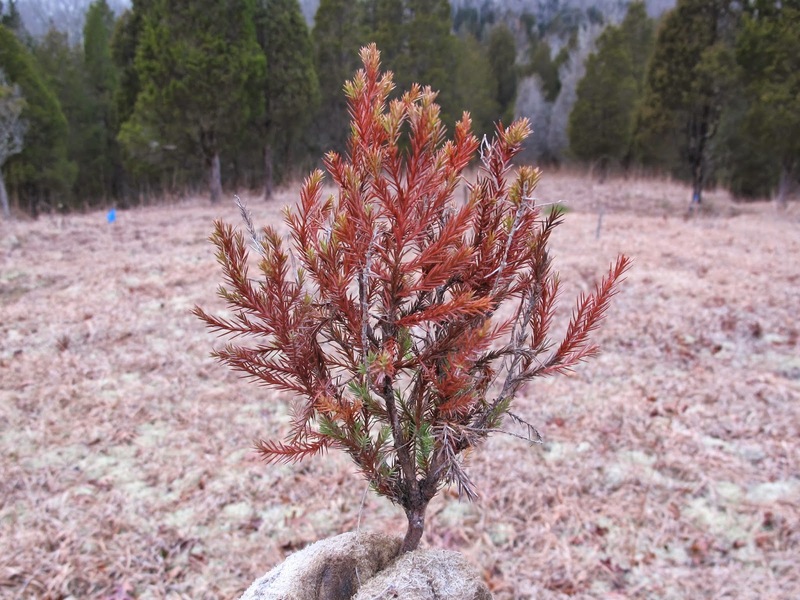 The red of the leaf matches closely the red coloration of a winter stressed cedar. 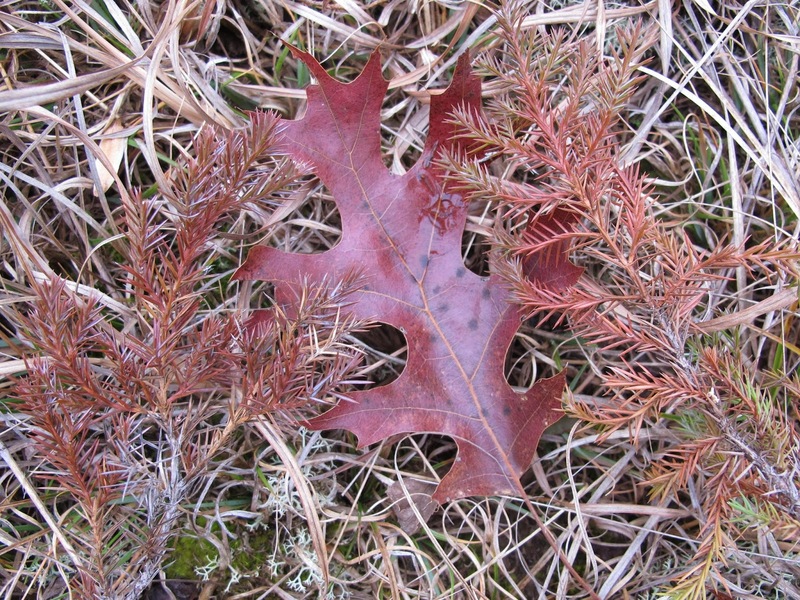 Leaves propped up in the grass look much like cedars and the red cedars are often identical to a leaf. I’ve found that Tuliptree seedlings are becoming invasive in many of the fields. They are most prevalent along the base of banks formed by massive gully erosion that occurred in the fields decades ago. Windblown Tuliptree seeds are carried by the wind until they fall over the bank. Only a small percentage of the seeds end up producing trees, but that is still quite a lot of trees growing where I prefer they were absent. The Tuliptree seed source is clearly visible at the edge of the woods south-west of the field. Prevailing winds carry the seeds several hundred feet into the field. Cutting and spraying the seedling Tuliptrees will be an added work item on next summer’s list. I’ve resigned myself to the fact that while working to complete one item on my list, I will find several more items to add in its place. I would hate to run out of things to do. There are always neat things to be found on the small cedars. This is the mud nest of a Potter Wasp. 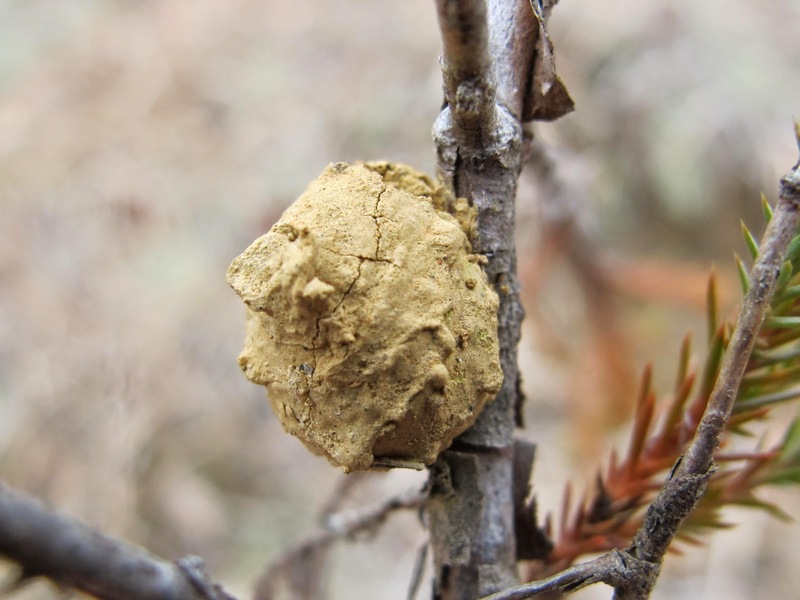 The wasp creates a hollow ball of mud in which are placed several caterpillars and a single wasp egg. The wasp larva feeds on the caterpillars and then pupates within the mud casing. 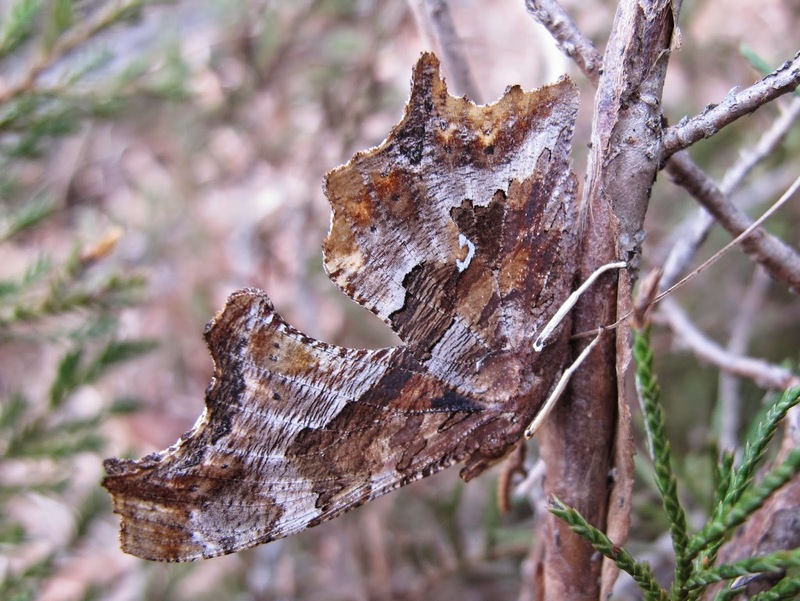 The Comma butterfly mimics a dead leaf, but it clearly didn’t belong on this cedar stem. Commas overwinter as adults and can often be seen flying on warm winter days. I found this one on a chilly morning and it wasn’t about to move. 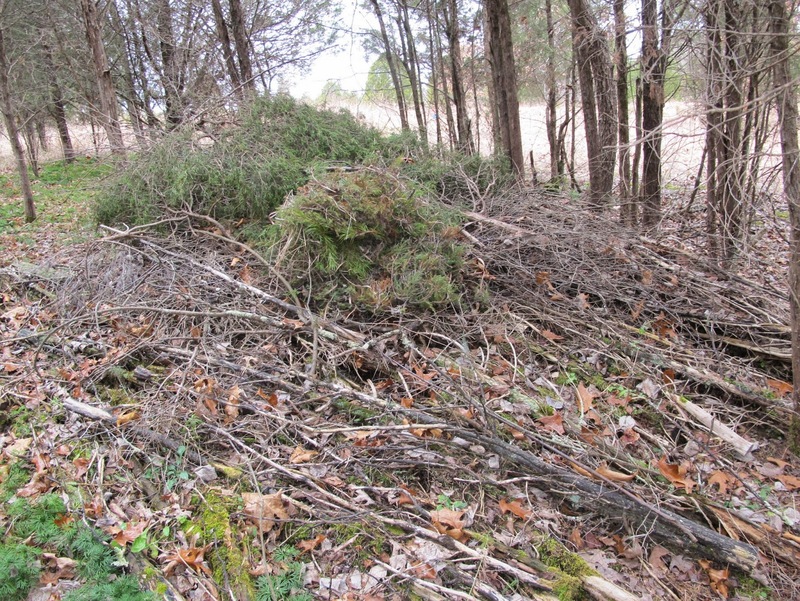 I carried the cut cedar, butterfly and all, and wedged it securely at the edge of the brush pile. I figured that if the butterfly didn’t move for the rest of the winter, it would be just as sheltered here as it would have been in the field. With a background of dead leaves, the butterfly’s camouflage worked quite well. Afternoon temperatures topped out at about 55 degrees. When I came by later, the butterfly had gone. 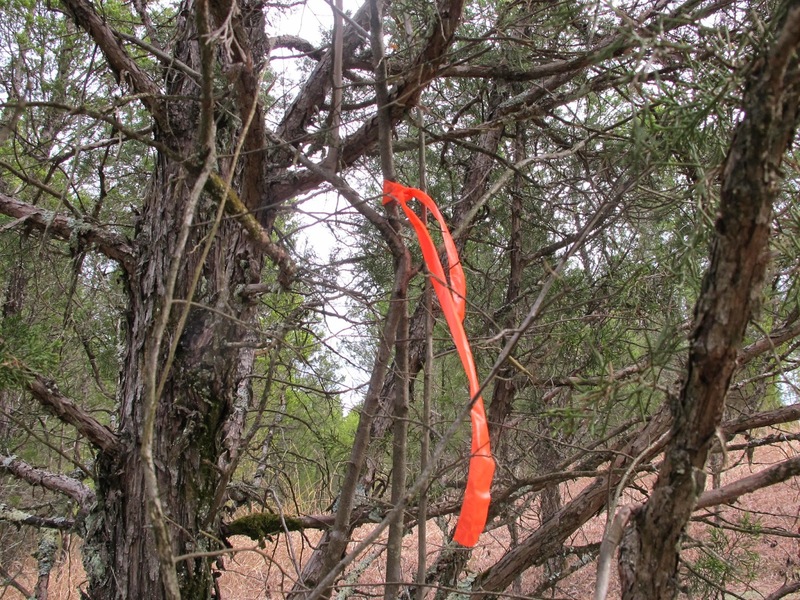 Hopefully, it went someplace more secure than the little cedars still to be cut. December is not the best time for botanical discoveries, since most of the native flora has shut down in preparation for winter. 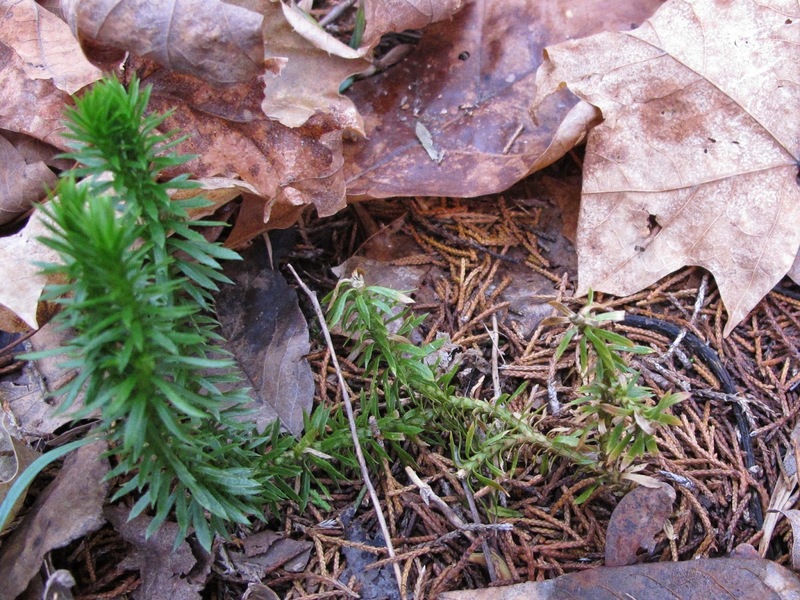 Despite this, I have just added Shining Clubmoss, Lycopodium lucidulum, as number 540 on my Blue Jay Barrens plant list. 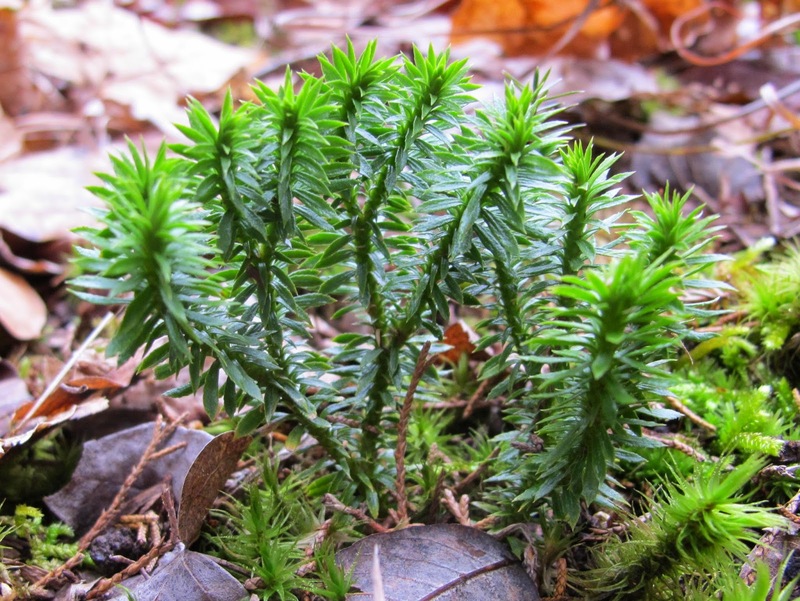 Though it only grows a few inches tall, Shining Clubmoss is an evergreen plant that becomes quite visible when most everything else is brown. The discovery was made while I was busy with my cedar maintenance project. 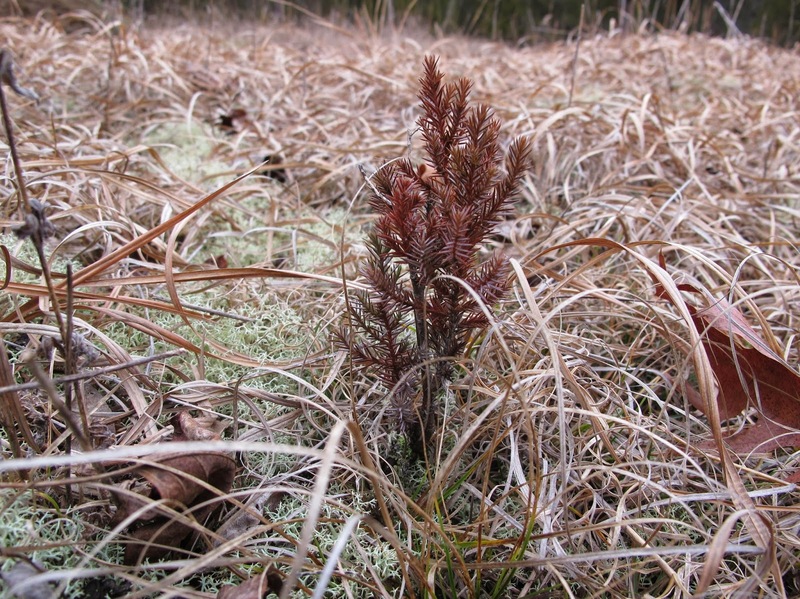 I was working my way along the north edge of a cedar thicket bordering one of the prairies and I noticed some green foliage that was much brighter than the typical mosses. 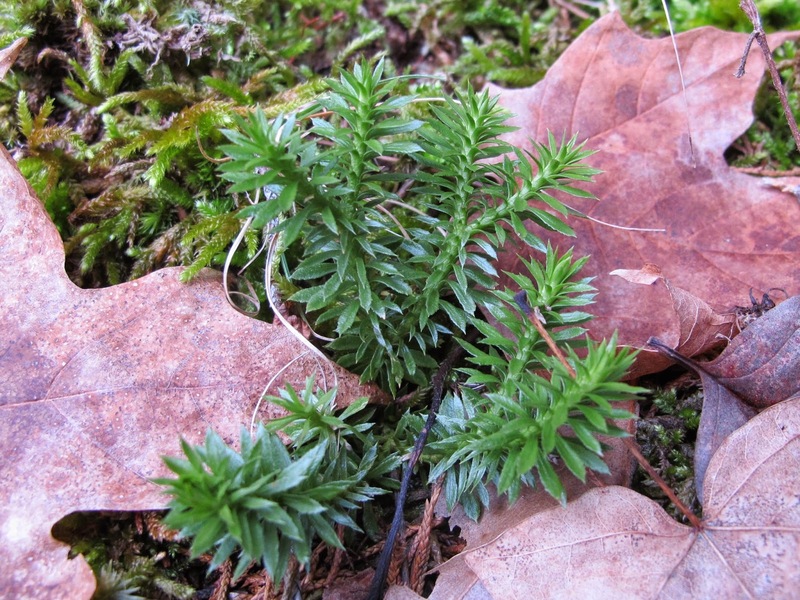 In all, there were about 60 small clumps of the Lycopodium growing in a slightly depressed area about 25 feet in diameter. 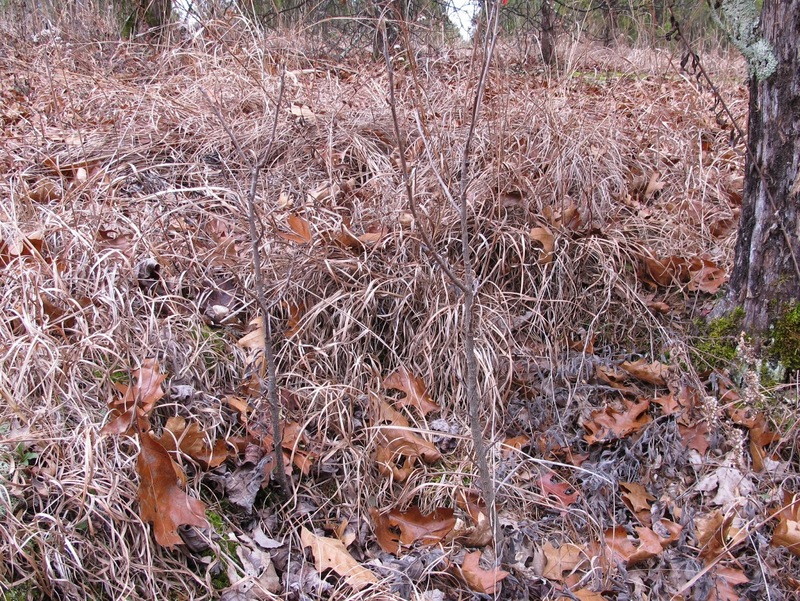 Vertical growth arises from a low growing horizontal stem. 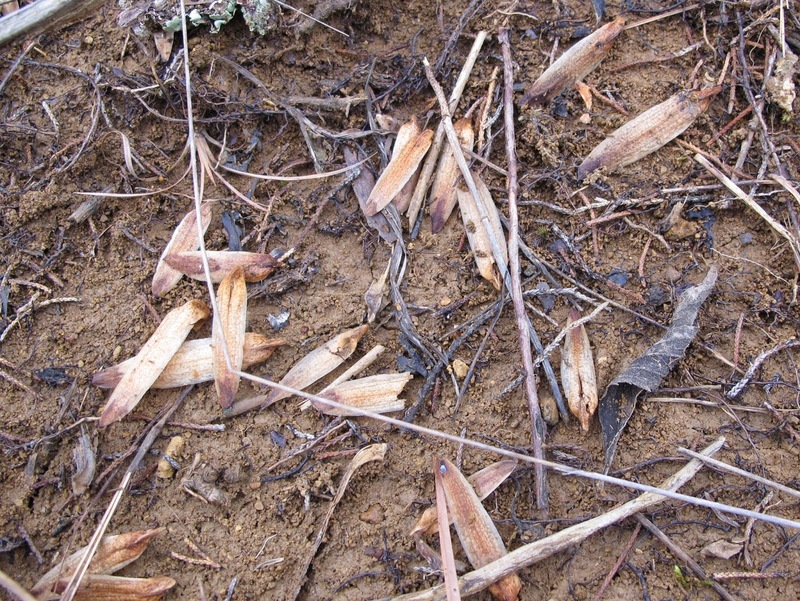 The stem often becomes buried by debris and develops roots. The rapidly growing stems can create a large collection of plants. 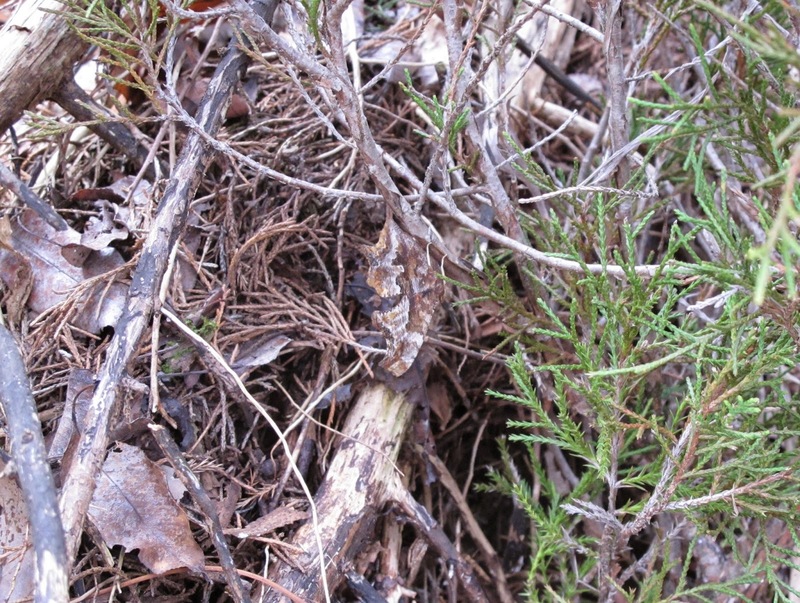 The narrow leaves are typically toothed from the midpoint to the tip. 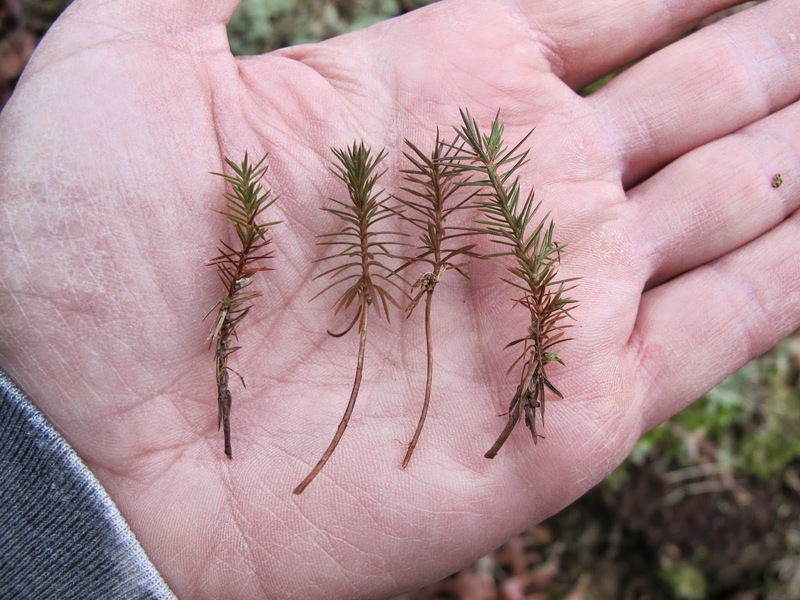 In addition to spreading by way of horizontal runners, Shining Clubmoss produces bulblets which are tiny plants that fall to the ground and begin to grow. 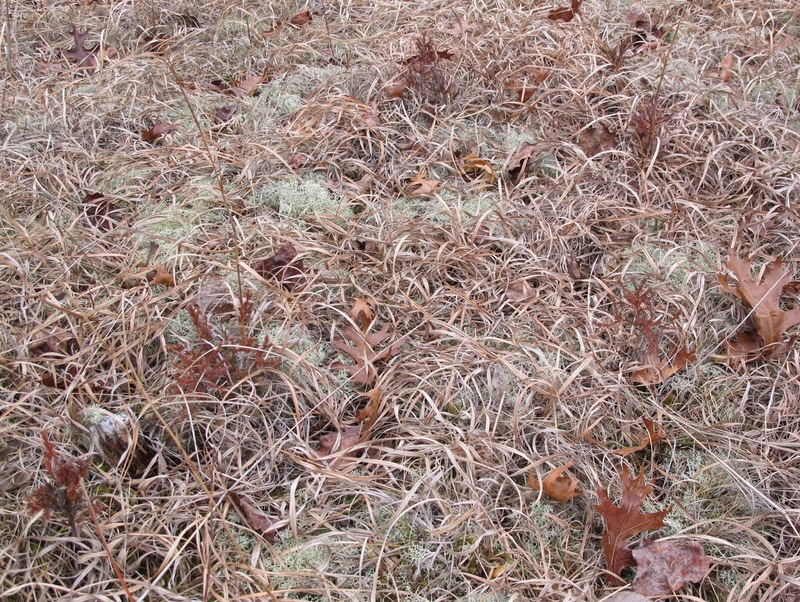 Also, like all other Clubmosses, the plants reproduce by way of spores. 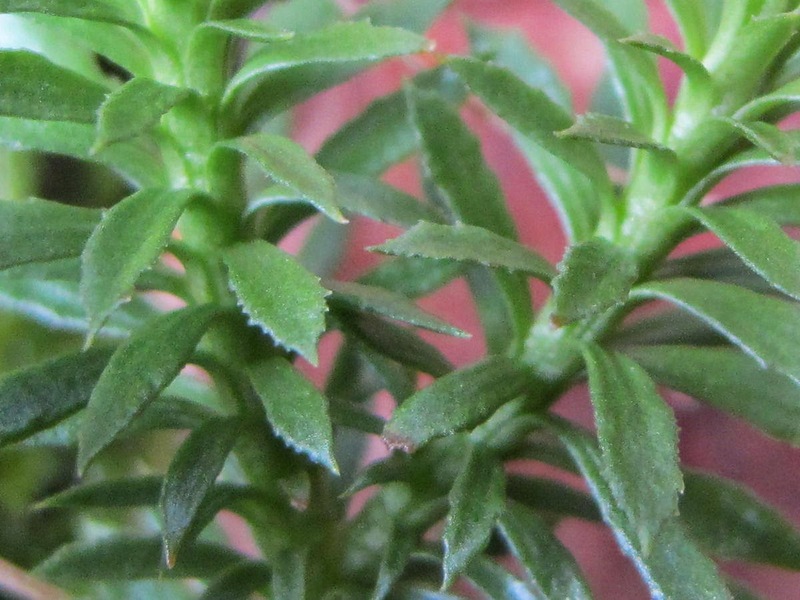 In the photo, bulblets are the growths on the upper right portion of the stem. 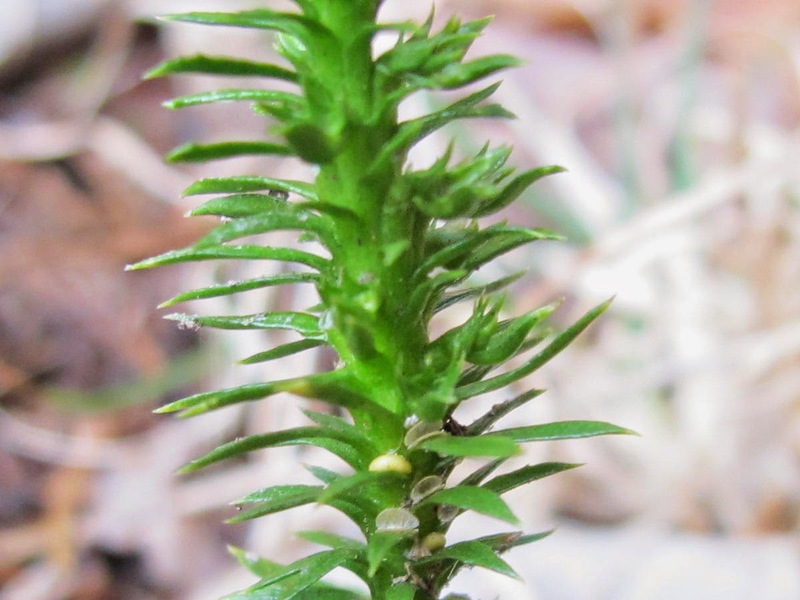 The yellow spore cases, some of which have opened to resemble empty clam shells, are located lower down in the photo at the base of slightly smaller leaves known as sporophylls. 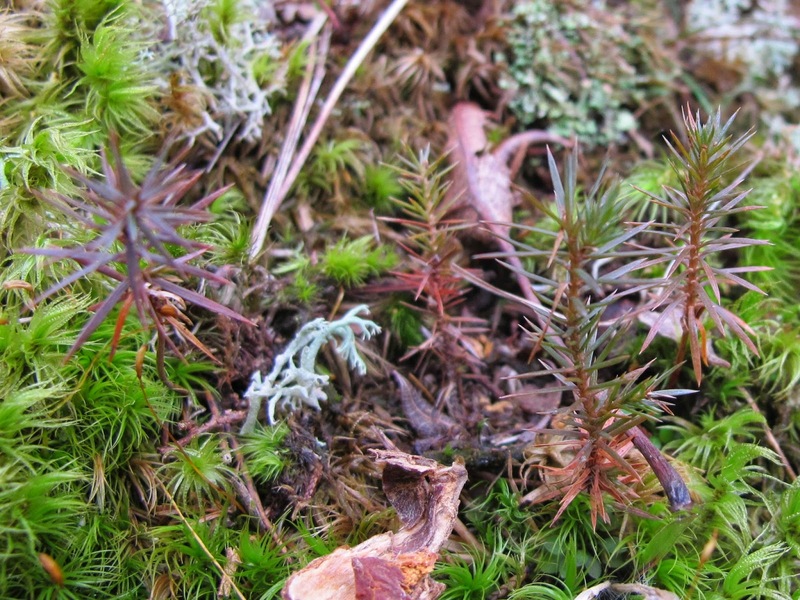 With such a variety of reproductive strategies, it’s odd that these plants aren’t more common. It’s always fun to add another plant to the Blue Jay Barrens list. 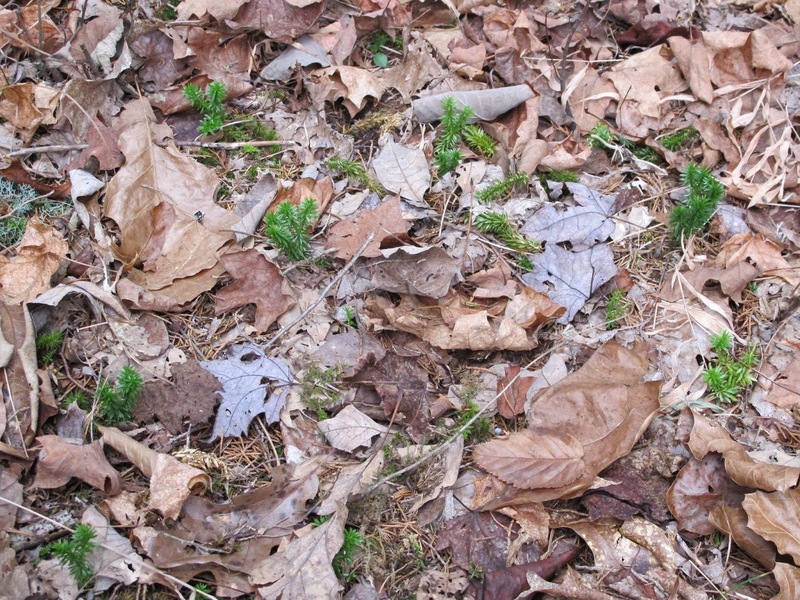 I’ll keep watching to see if the Shining Clubmoss turns up at other locations on the property. I always have a list of maintenance activities that need to be completed. When conditions prohibit me from working on higher priority jobs, I spend time on one of the maintenance list items. Tasks from the maintenance list periodically get shifted to the priority list. 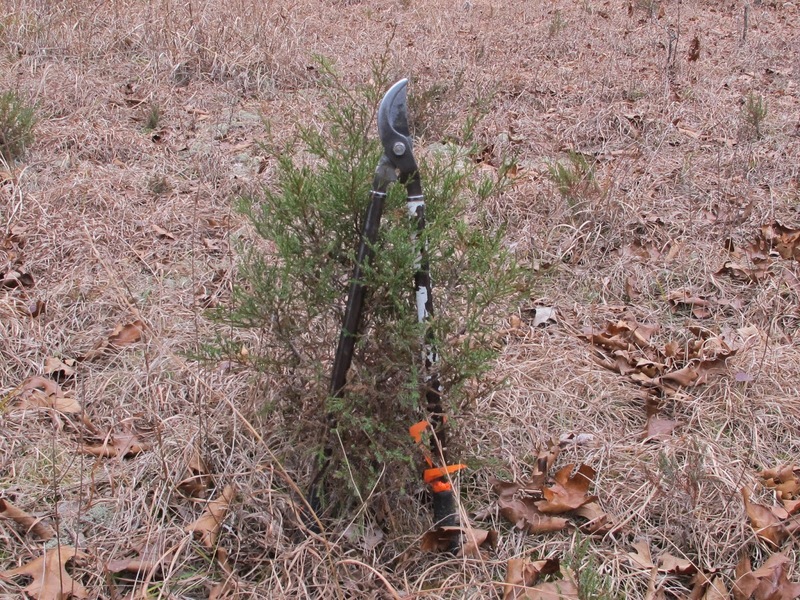 One such activity is what I term Cedar Maintenance, meaning that I maintain the open condition of a field by removing young Eastern Red Cedars from the area. 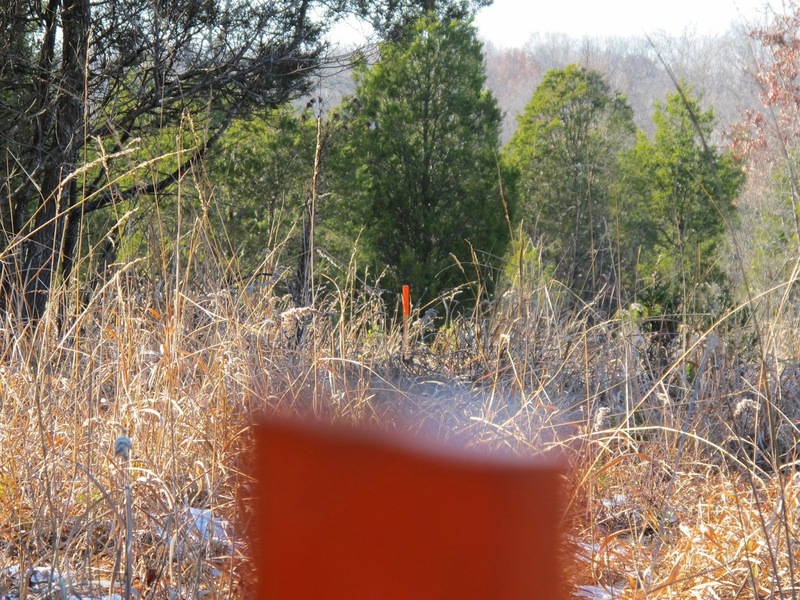 It has been ten years since I have conducted Cedar Maintenance in some of the prairie openings. 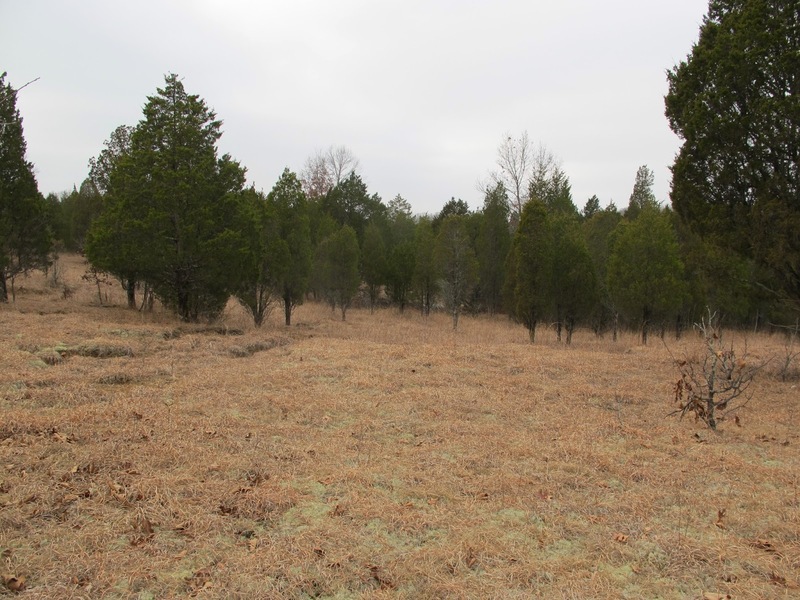 I decided that Cedar Maintenance needed to be brought up-to-date in order to prepare for management activities planned for next year, so over the next few months I will be searching for and removing young cedars from about 25 acres of prairie area. Stumps still remain from my initial clearing efforts done 20 or more years ago. 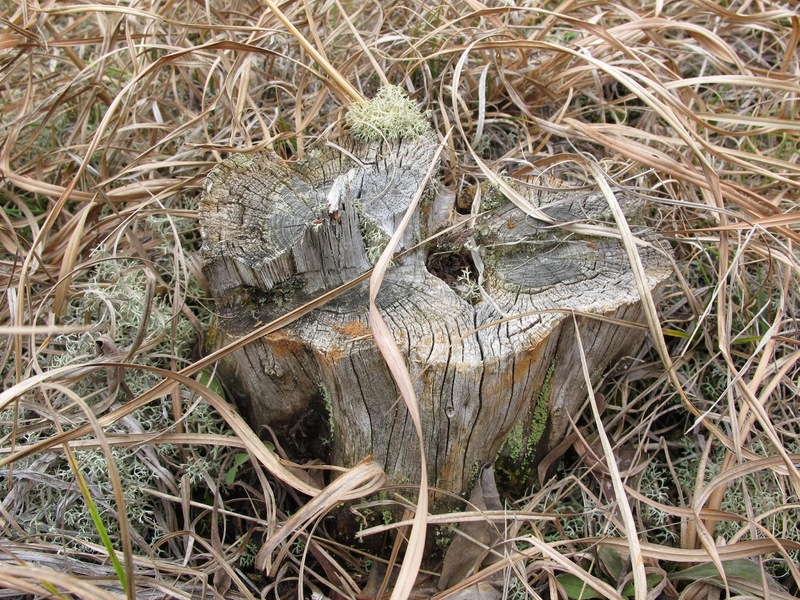 Some of these stumps are as solidly in place as they were at the time of their cutting and will probably remain for decades as reminders of how conditions once were in the fields. 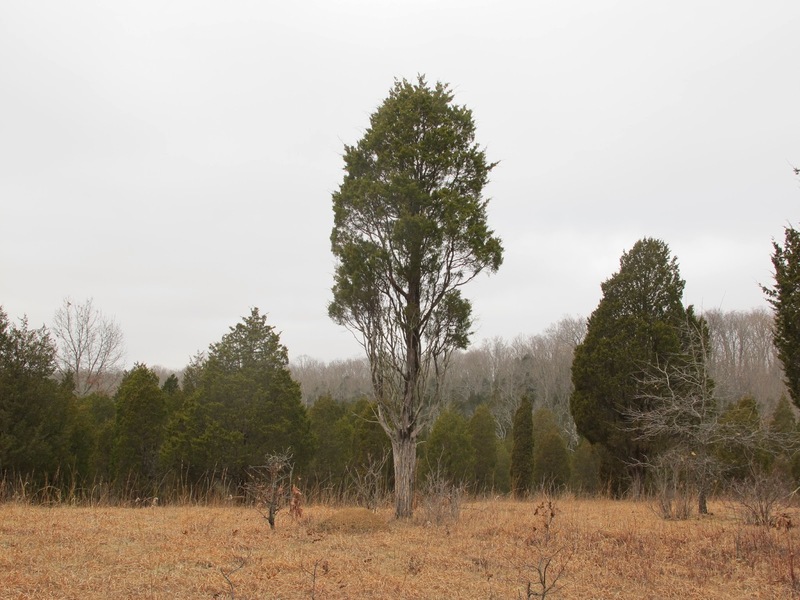 In some of the harsher areas, cedars have managed to grow only a few inches tall in ten years. This small plant seems to have died back several times during the last few years. 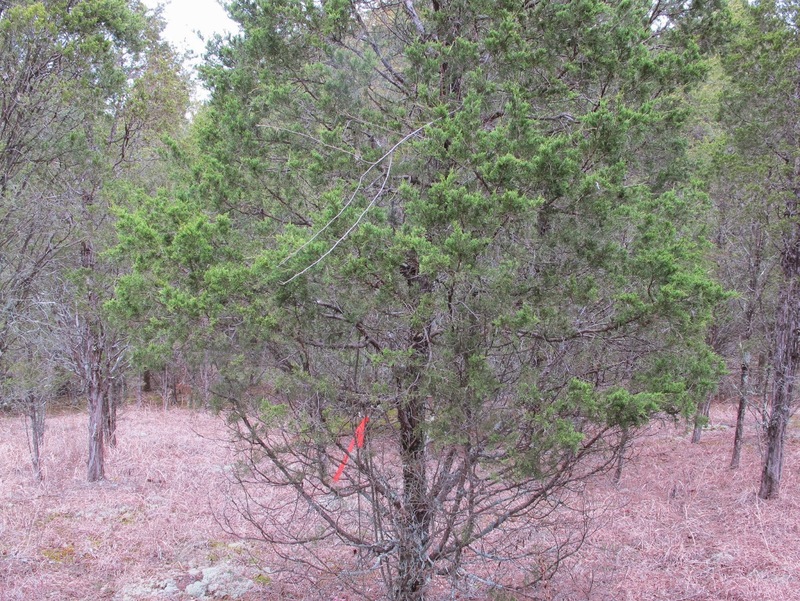 Despite its small size and the fact that it doesn’t yet pose a threat to surrounding vegetation, this cedar is a target for removal. While performing Cedar Maintenance, I remove any cedar that is large enough for me to see. 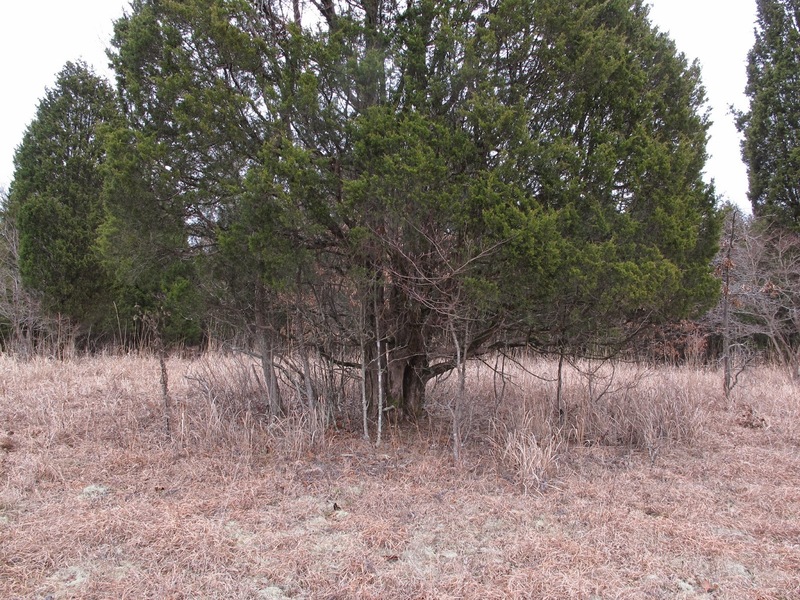 The largest of the encroaching cedars was found in this field. The ridgetop soils are a bit deeper and provide a slightly better growing environment than the extremely shallow soils on the slopes. My medium sized loppers, now in their 25th year of service, measure 26 inches from end of handle to blade tip. This largest of encroaching cedars topped out at 30 inches. Had I planted this tree as a landscaping specimen ten years ago, I would be terribly disappointed in its rate of growth. Checking the growth rings on the small cedar makes me think that it is one that I missed cutting ten years ago. The age looks to be closer to 12 or 13 years. It’s hard to maintain a precise search pattern in large areas, so I use lines of orange lath to break the field into smaller units. I then use rows of red and blue flags to break the units into manageable search areas. After searching each area, I move the back row of flags forward to form the next area. When I finish with a field, I’ll have seen every square foot of it. 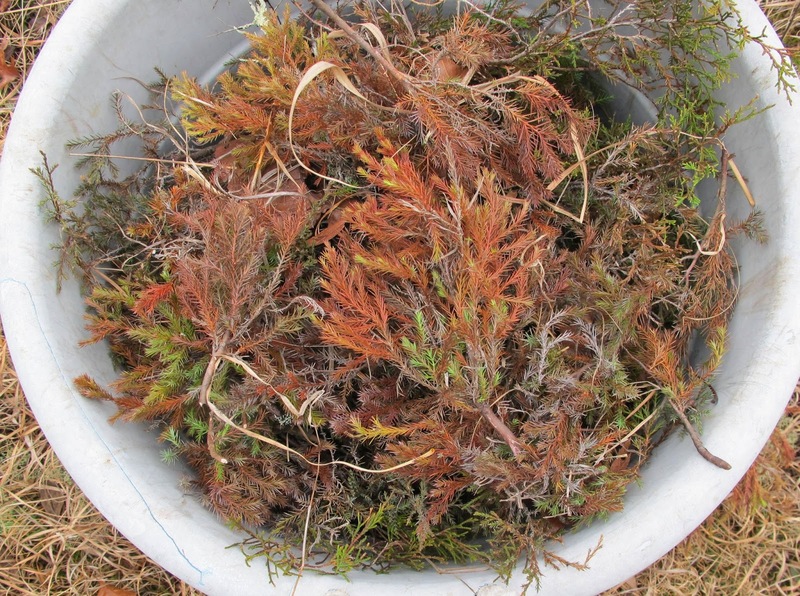 I collect the cut cedars in bushel sized tubs and deposit the cut material on top of old brush piles. Piling the cedars requires slightly more time, but removing the cut cedars allows me to clearly see that I have left no standing cedars in the management area. 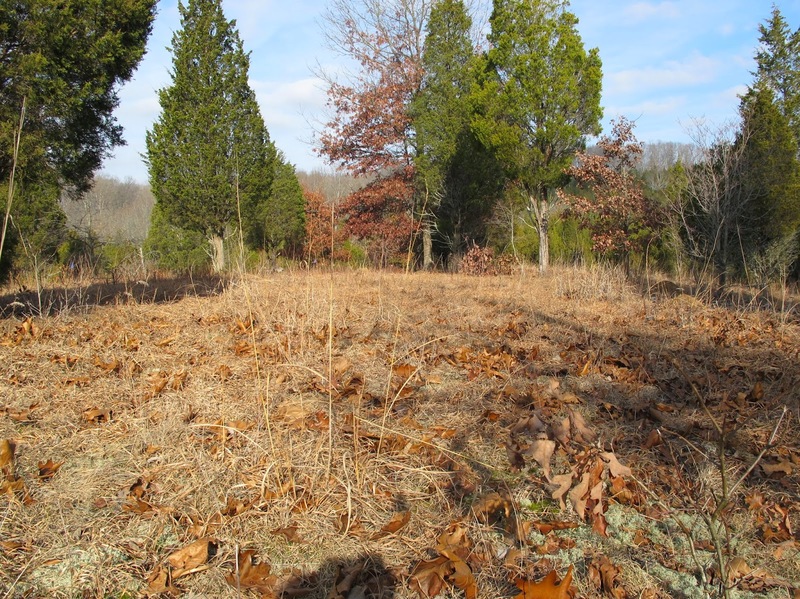 This brush pile contains the remnants of the cedars removed when the field was first cleared. At one time the height reached ten feet and I needed a short ladder to climb high enough to put more cedars on top. 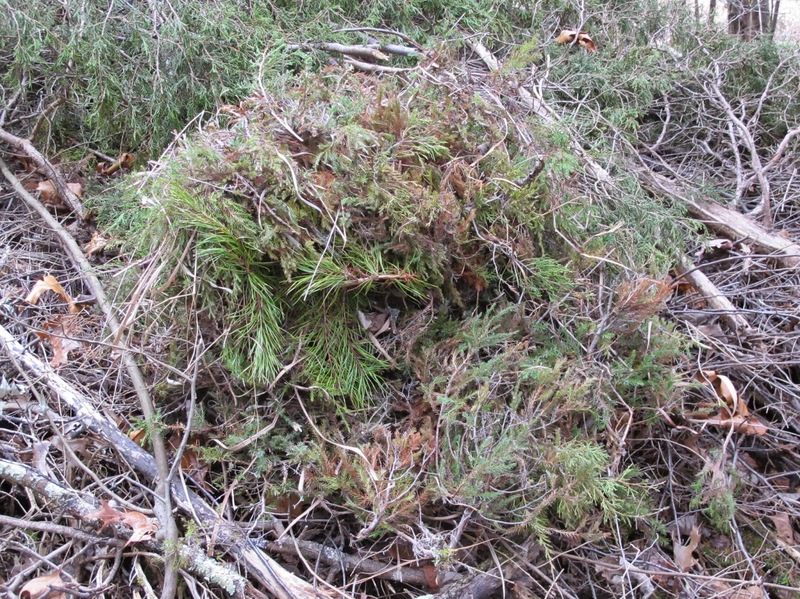 The green branches in the back part of the pile are some medium sized cedars that were cut from the edge of the field. The smaller pile in the foreground is from my current Cedar Maintenance. 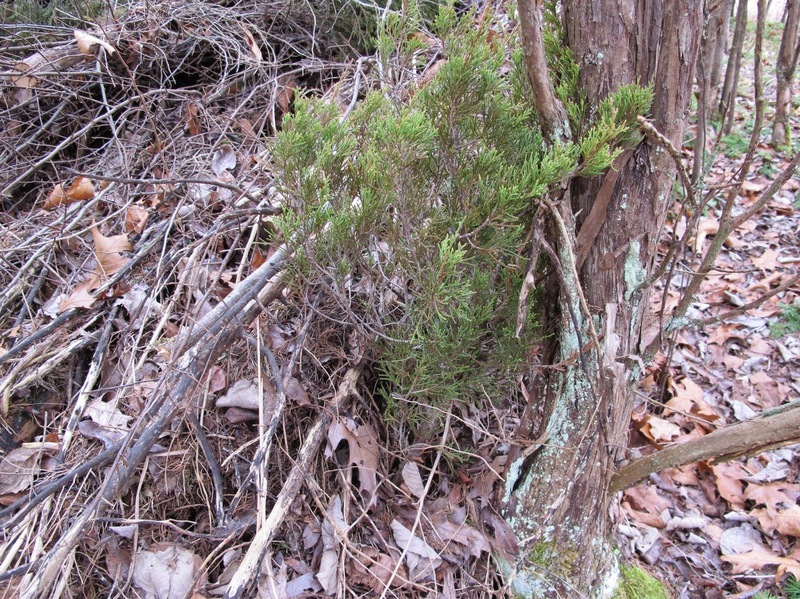 This small pile, about two bushels worth, is composed of one Virginia Pine and about 200 small cedars. It represents cedar growth on about one acre of prairie. I spent two hours compiling this collection, with a little of that time spent looking at interesting things discovered in the field. Cedar Maintenance generally requires that you be looking down most of the time. Discovery of a rather large collection of Autumn Olive leaves caused me to look up. 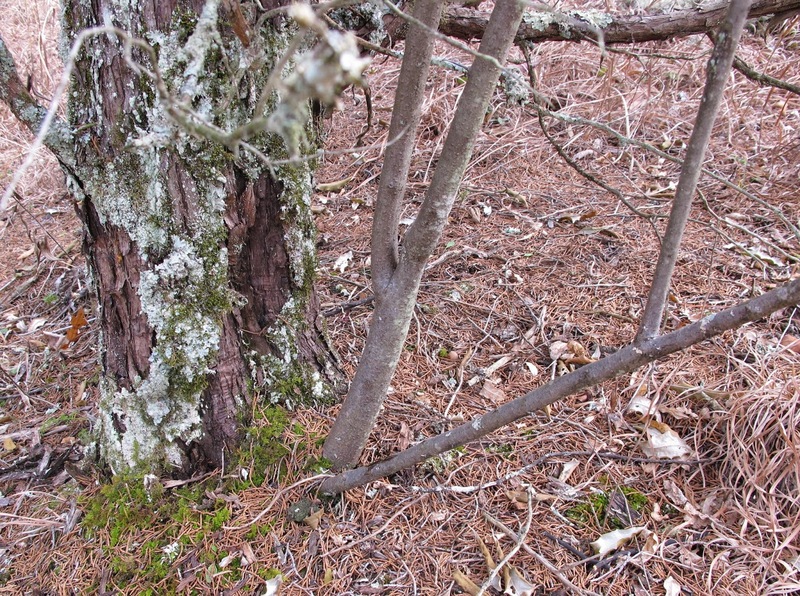 Emerging near the base of a mature cedar is the trunk of a large Autumn Olive bush. The Autumn Olive has grown straight up through the crown of the tree. I watch for things like this, but foreign stems hiding inside a cedar are nearly impossible to spot. 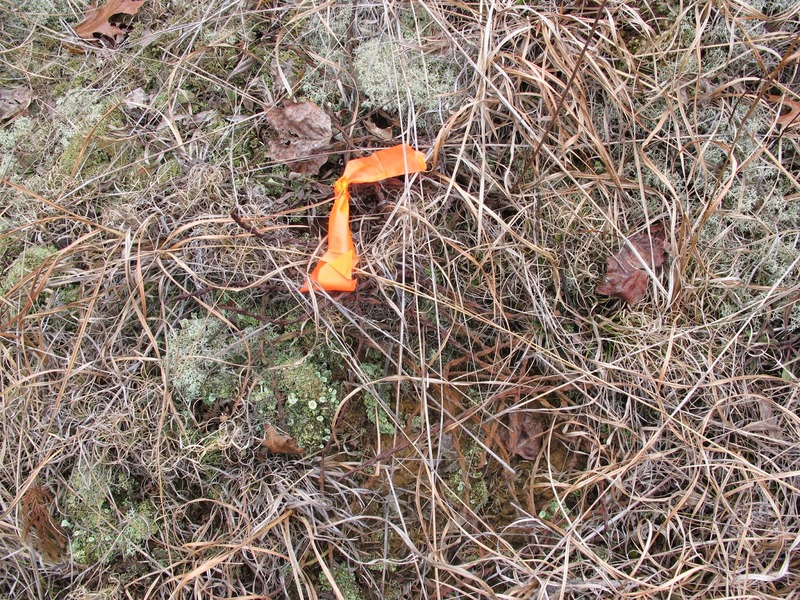 Since rain was threatening, I marked the invasive shrub with bright orange ribbon, so I could come back on a dry day to cut and spray. Leafy Autumn Olive branches don’t leave the security of the cedar until they are well above the ground. I take documentary photos each time I find a large Autumn Olive. My hope is to one day be able to show the photo of the last mature Autumn Olive to be found at Blue Jay Barrens.